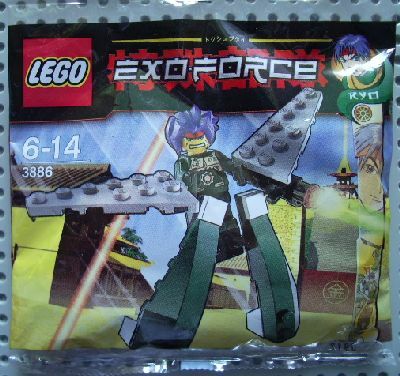 LEGO Exo-Force is a LEGO toy line based on the popular mecha genre from Japanese manga and anime. Mecha fans have long used LEGO bricks to build both imaginative new designs and their interpretations of classic mecha, but Exo-Force is the first time LEGO has dedicated a whole toy line to this theme. The story of Exo-Force portrays brave young pilots who use battle machines and teamwork to overcome overwhelming odds in their war against an army of evil robots. On Sentai Mountain, there was a peaceful civilization where advanced robots and the ancient way of life went hand in hand. But one day, a golden robot named Meca One led the robots to revolt against the humans. Fights between the humans and robots broke out, unleashing uncontrollable energies that divided the mountain in two. The humans eventually overcame the robots, and cast them into the gorge. The humans built bridges to link the two halves of the mountain. The most important bridge they built was the Tenchi (天地 "heaven & earth") Bridge. Some humans, including Sensei Keiken, feared that the robots might come back someday so Sensei Keiken promptly began to construct armored battle machines for defense. But before the humans' preparations were complete, the robot legions, armed with battle machines of their own, caught the humans by surprise and quickly seized control the southern half of the mountain. More powerful than ever, their primary aim was this: to completely drive humanity from Sentai Mountain. Sensei Keiken hurriedly recruited new pilots to man the battle machines and Exo-Force was born. The Exo-Force storyline for 2006 culminated in the Battle of Sentai Fortress when Meca One unleashed an all-out assault on the humans. After a narrow victory, Keiken decided that Exo-Force was too vulnerable in the Sentai Fortress and that they needed an "edge" to defeat the robots. The 2007 storyline centers around Exo-Force's discovery of the legendary Golden City at the top of Sentai Mountain and mysterious secret codes therein which could be used to unlock powerful technology. Keiken's hope was that this technology would provide the crucial key to defeating the robots. In the 2008 storyline, Keiken is being held captive by the robots in the jungle at the base of Sentai Mountain. The Exo-Force pilots must rescue their leader in this hostile jungle environment that holds the secret to what gave the robots life and the will to destroy. 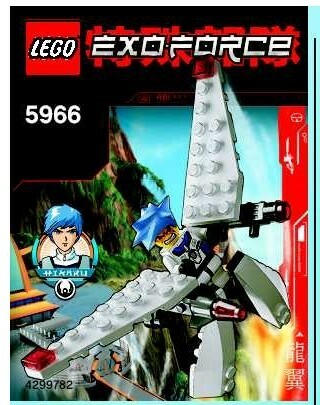 Although Exo-Force has many members, the LEGO sets and official storyline focus on the following characters. Hikaru (光 ?, "light", "shining") - Hikaru is serious, silent, and wants to win. He prefers to work solo, but has learned to count on his teammates. He is a natural tactician and commander, though he can seem cold or overly logical at times. Hikaru is an incredible marksman and highly skilled at aerial combat. Takeshi (武 ?, "military", "warrior", "chivalry") - Takeshi is grim, fierce, and a little crazy. He lives for one thing – to smash robots and their battle machines into tiny little pieces. Unlike Hikaru, Takeshi is much more likely to react instinctively and emotionally in a crisis, rather than relying on logic and planning. Ryo (亮 ?, "bright", "clear") - Ryo talks and moves fast. He is a whiz with any kind of tool or circuit. He was part of the design team that created many of the battle machines used by Exo-Force. Ryo is incredibly gifted at engineering and repair work, with a real flair for technological improvisation in a crisis. Ha-Ya-To (隼人 ?, "falcon person") - Ha-Ya-To is adventurous, a joker, and loves to fly. He's at his happiest and most comfortable in the air, even if it means putting himself in harm's way. He is addicted to the adrenaline rush of battle and usually has a joke on his lips no matter how bad the situation. Keiken (経験 ?, "experience") - As Exo-Force's aged and wise leader, Keiken has a long history. It was he who first designed Meca One, the robot who later led the rebellion against the human race. Stern, paternal, firm in his convictions and universally respected, Keiken provides the guidance the young pilots need. Hitomi (瞳 ?, "pupil") - Granddaughter of Sensei Keiken, Hitomi showed an aptitude for mechanical work from an early age. She is smart and smart-mouthed; a risk-taker who feels she has something to prove. During a fierce robot attack, she had the opportunity to commandeer an untested battle machine, the Blazing Falcon. 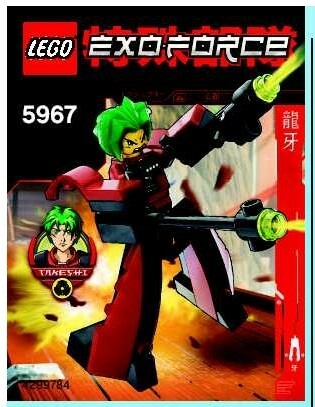 Using it to defeat the robots, her heroism left Keiken no choice but to make her a full member of Exo-Force. After Sensei Keiken was kidnapped by Meca One, Hitomi was surprised to find out that her grandfather had left instructions that she should be in charge of Exo-Force in the event of his capture. Meca One - Meca One is cold, ruthless, and arrogant. As the first robot to rebel against the humans, Meca One is now the supreme leader of the robot army. Meca One has replicated itself as a safety measure, which makes it more difficult for Exo-Force to simply target Meca One and try to end the rebellion that way. Devastator - Devastators are sly, cunning, and cruel. These silver robots are the elite troops of the robot rebellion. Devastators have been known to go out of their way to cause damage to civilian dwellings, or to pursue wounded battle machines for long distances just to finish them off. Exo-Force pilots have reported seeing Devastators of various colors. Iron Drone - Iron Drones are strong and durable. As the foot soldiers for the robot army, they are very good at following orders, but terrible at improvising in an unexpected situation or devising any kind of strategy. The Exo-Force story is told through a series of online comics on the official website. As of 2007, a new comic was released approximately every month. Below is a list of the titles and release date of each episode. The Exo-Force chapter books were published in collaboration with Scholastic. This chapter book series was cancelled in late 2007 apparently because of poor sales, thus the last two books on the list below were never released. 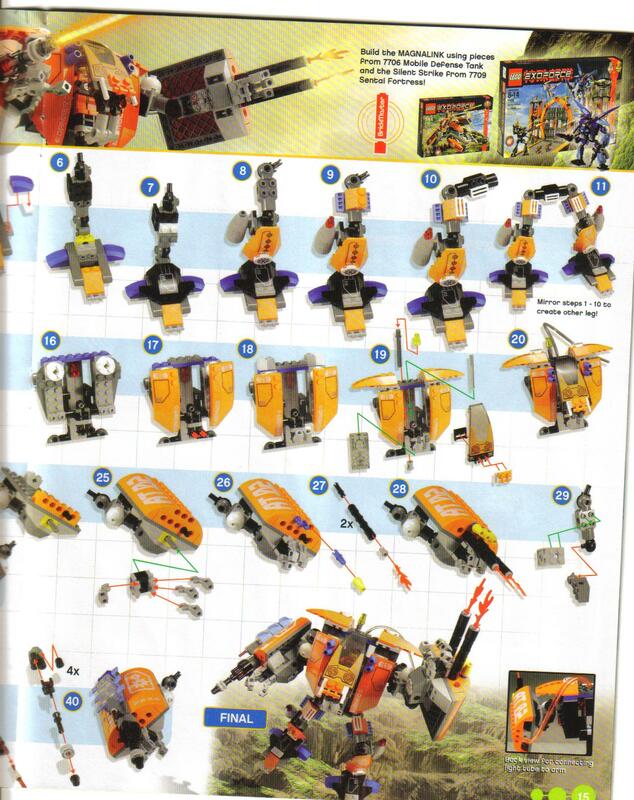 The following list of LEGO Exo-Force sets includes all known official names found on packaging or in the official LEGO website and magazine. 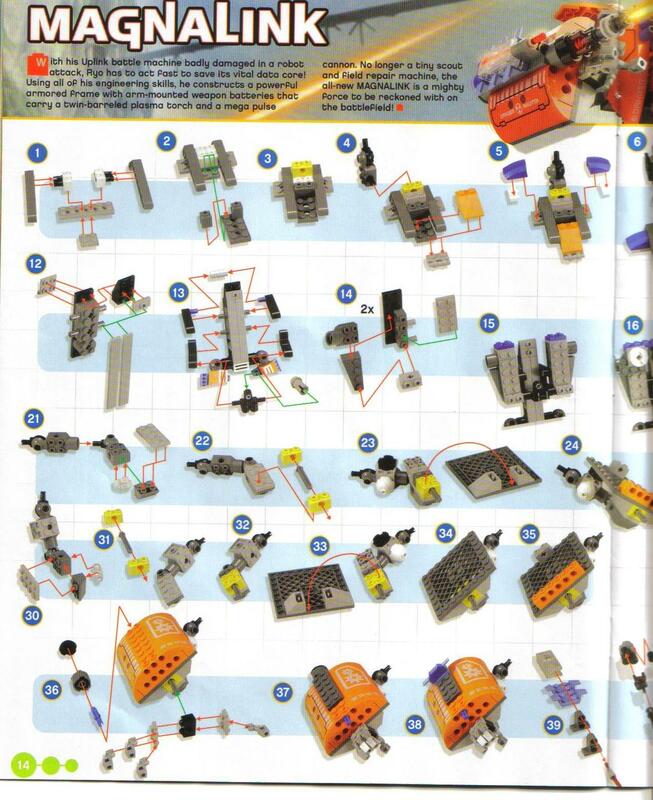 Note there are several battle machines and alternative models that have not been given official names by LEGO. 7700 Stealth Hunter - Protected by a prototype stealth coating that makes it invisible to sensors, the Stealth Hunter uses its ultra-light exo-glider wings to fly undetected behind enemy lines and take out the robot targets using its dual-blade electro-sword and high-precision laser rifle. It has 8 cm (3") of intractium armor. 7701 Grand Titan - The Grand Titan is heavily armored with 20 cm (8") of intractium armor. It is equipped with an electro-magnetic pulse (EMP) "Fang" pincer and a rotating laser cannon. 7702 Thunder Fury - Surprisingly fast given its size and 20 cm (8") of tenatium armor, the Thunder Fury's titanium razorblade powersaw (v2.0) and automatic high-density laser cannon make it a major threat to the humans of Sentai Mountain. 7703 Fire Vulture - The Fire Vulture is part of the air arm of the Robot rebellion. It has 10 cm (4") of tenatium armor and flies using a hyper-turbine jet engine mounted on its back. It is armed with a powerful long-range flamethrower and electro-vulture claws that can tear enemy armor to bits. 7704 Sonic Phantom - Powered by four nuclear engines, the Sonic Phantom is perfect at making quick, dangerous air raids with its wide-angle laser cannons, and concussion missile launcher. 7705 Gate Assault - The humans must stop the robots from taking the First Gate. Ha-Ya-To pilots the Gate Defender micro battle machine to defend against the robots' Sentry II micro battle machine and R-1 Robot Rammer (a reconditioned mining vehicle). 7706 Mobile Defense Tank - Armed with machine laser cannons and an energy disc launcher, this tracked vehicle is designed to battle the robots on even the roughest terrain. 7707 Striking Venom - A massive mobile battle station, Striking Venom can carry and recharge robots in battle. Its shovels are used for digging in and hiding to surprise its enemies. 7708 Uplink - In addition to being a battle machine, the Uplink is designed to be a "medic" for other battle machines. It contains a wide-array of built-in maintenance equipment which can get a damaged battle machine up and running rapidly. 7709 Sentai Fortress - The robot army is attacking Sentai Fortress! Meca One pilots his personal battle machine accompanied by two Iron Drones and a mini Venom Walker. To counter-attack, Hikaru pilots a full-sized blue battle machine, the Silent Strike. 7711 Sentry - The mass-produced Sentries attack in large numbers to overwhelm opponents. The robots fully expect that most Sentries sent into battle will not come back, and they do not care – they will just make more. 7712 Supernova - Powered by the sun, the Supernova uses its solar-powered laser staff and double-barreled laser cannon to defeat the robots. 7713 Bridge Walker vs. White Lightning - Ha-Ya-To pilots the White Lightning, an ultra-fast flying battle machine armed with dual machine cannons and a disk launcher, to take on Meca One's titanic Bridge Walker, a massive battle machine armed with lasers, cannons, and missiles. 7714 Golden Guardian - Discovered in a secret Golden City vault, the Golden Guardian is a legendary battle machine that has been assigned to Ha-Ya-To who uses it to protect the Golden Tower. Although initially land-bound, the Golden Guardian has been fitted with jump jets to enable it to make rocket-powered leaps and even fly for short distances. It is armed with a massively powerful mega-cannon arm and a nearly impenetrable blast shield. 7721 Combat Crawler X2 – This massive mechanical menace packs twice the danger and twice the firepower, because it's two mighty battle machines in one! In combined mode, it scales the cliffs of Sentai Mountain or the walls of the Golden City with its clawed legs, prison capture cage and powerful firing cannon, but when the battle gets tough, its front end detaches to fight as a raging robot battle machine of its own! It's up to Ryo and his missile-launching strike flyer to stop them both…if he can! 8100 Cyclone Defender - Found by Ryo in the Golden Tower, the Cyclone Defender has 6" of zaylium armor, a variable-pulse blaster and rotating bladed defense shield. 8101 Claw Crusher - Armored with 8" of tenatium armor and armed with rotating blaster cannons and gigantic ripping claws, these mass-produced mini battle machines are a great threat in close combat. 8102 Blade Titan - Massively armored with 12" of zaylium armor, this battle machine carries an arsenal of heavy-duty weapons including a multi-barreled proton cannon and double-bladed assault shield that expands and rotates automatically. 8103 Sky Guardian - This multi-winged, jet-powered battle machine has 5" zaylium armor and is the fastest and most agile opponent the robots have ever faced. What the Sky Guardian’s long-range launching energy sphere and particle beam rifle does not take care of, its massive armor-slicing energy sword will! 8104 Shadow Crawler - The Shadow Crawler is armed with laser cannons and a destroyer disk launcher. With 10" of tenatium armor covered with a stealth coating, the Shadow Crawler is able to operate in full stealth mode and scale any surface. Mounted atop each Shadow Crawler is a prison pod for human captives. 8105 Iron Condor - With a metallic screech, Iron Condors almost always attack in pairs. It has 6" of tenatium armor, razor-sharp talons and a missile that magnetizes its target, robbing enemy battle machines of their ability to maneuver. 8106 Aero Booster - The Aero Booster is a standard battle machine body with a massive, detachable rocket and weapons pack. This amazing piece of machinery allows the Aero Booster to achieve speeds even exceeding that of the Sky Guardian, as well as giving it weapons power superior to any other battle machine in Exo-Force's arsenal. 8107 Fight for the Golden Tower - The Golden Tower is the tallest building in the Golden City and houses the massive computer that is the central knowledge storehouse. It is here where Exo-Force pilots bring the codes they have retrieved for entry into the computer. When the Sonic Raven attacks from the skies with double firing rockets and twin rotating turbines, Hitomi fights back with the tower’s launching missile, golden energy swords and more! 8108 Mobile Devastator – This rolling robot base is the newest and most powerful weapon put in the field by Meca One. The ultimate wheeled mobile fortress features an elevating battle tower with rotating laser guns, destroyer sphere launchers, prison pods, and more. The only thing that stands in its way is Ryo in the Blazing Falcon battle machine with slashing claws and firing rocket! 8111 River Dragon - With oversized turbines for amphibious action, Ha-Ya-To's new battle machine takes the fight to the robots wherever they are! 8112 Battle Arachnoid - Striking with its armour-piercing fangs, this blast jet-powered robot battle machine is a dangerous threat! 8113 Assault Tiger - This heavy-duty battle machine is armed and armoured for all-out battle! With its tiger-stripe camouflage, spinning buzzsaw and transforming mini-robot weapon, it's ready to take on any foe. 8114 Chameleon Hunter - Capable of short bursts of flight that resemble mighty leaps, the Chameleon Hunter can vanish from sensors with the help of camo-phores built into its zaylium armor plating. It then appears out of nowhere to attack with its flame-blaster cannon and triple-pronged claw! The agile mini-robot can use its twin mantis blades to pierce the vital circuitry underneath robot battle machine armor. 8115 Dark Panther - Leaping from the shadows, this four-legged robot battle machine strikes without warning! Drones detach and attack with jetpacks, cannon elevates, and weapon converts to mini-robot scout. 8117 Storm Lasher - Like a giant supersonic dragonfly, the Storm Lasher is equipped with diamond-edged turbine fans and heat-blade mandibles. Its infrared sensors can "see" through the forest canopy so its long-range plasma cannon arrays can blast targets below. A mini-robot recon drone with camera relays also helps to detect enemies on the ground. 8118 Hybrid Rescue Tank - Using a unique tread/wheel traction system, the Hybrid Rescue Tank can roll over – or through – anything the robots or jungle can throw in its path. Its multi-barreled rotating rail blaster fires high-velocity bursts that can shred the armor of the toughest robot battle machines. Best of all, the top turret can detach and convert into a flying vehicle for scouting and recon missions. One of the features of the Exo-Force toy line is that two or more battle machines can be combined to make a super battle machine. These promotional sets were released in Europe (e.g. packaged with Donald Duck magazine in Denmark) and are not part of the main toy line. 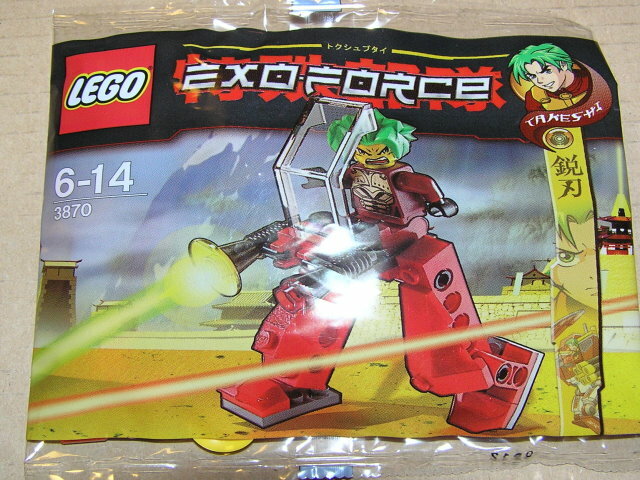 The motto for Exo-Force in 2006 was "Time to Power Up!" Sentai (戦隊) means "battle squad". The name "Genki" has appeared on the Exo-Force website (in both a quote on Ha-Ya-To's profile and in the online comic). Although Genki may have originally been slated to be an Exo-Force character, Lego writer Greg Farshtey has confirmed that the idea for Genki as a character was dropped, and the minifigs with black hair and orange suits are unnamed "generic" Exo-Force members. However, the name "Genki" is still often used by the Exo-Force fan community in referring to the generic soldier. 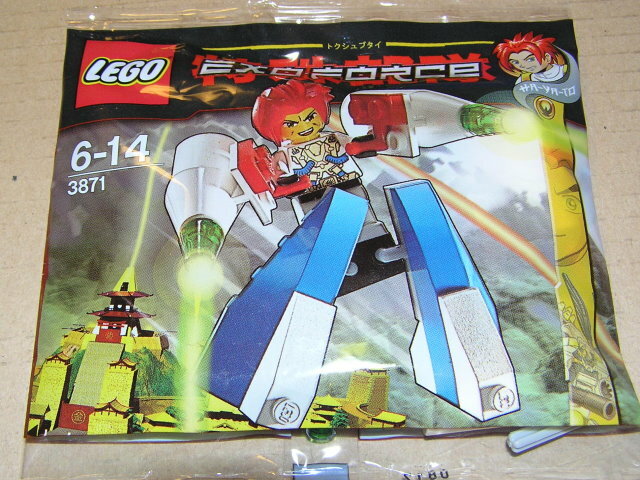 In 2006, Lego commissioned Shoji Kawamori to design combination models using various Exo-Force sets. The combo-units were called VAN-Force; they featured custom decals, which were given away with purchase of bundled Exo-Force sets in Japan. The first VAN-Force design used the Stealth Hunter and Grand Titan. 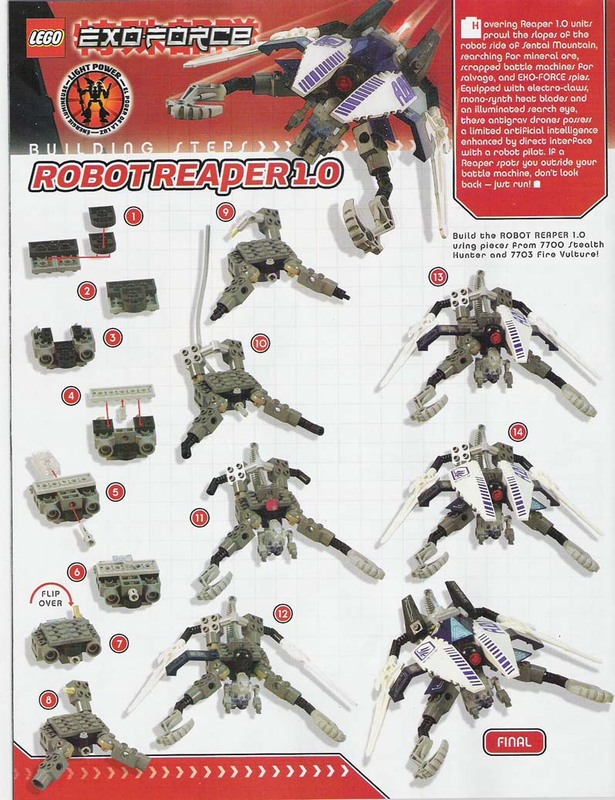 A second combination design called "Raiden" (which uses the Stealth Hunter, Grand Titan, and Thunder Fury) was revealed in December 2006. In Kawamori's Macross fashion, the units can transform between from robot to vehicle. According to Exo-Force writer, Greg Farshtey, Lego does not have the rights to reproduce the VAN-Force design for sale in stores. 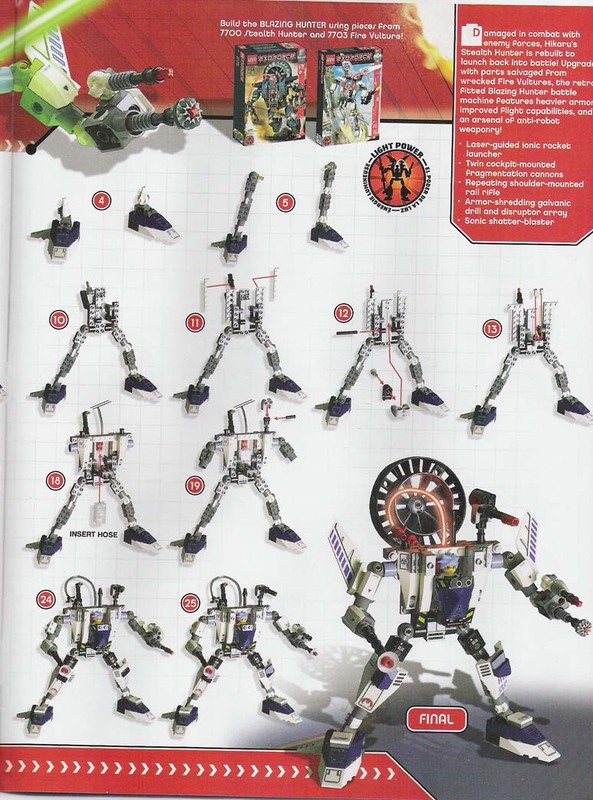 Skeletons were added in some robot sets because the set designers wanted to show that certain capsules are prison pods without having to include an entire additional minifigure. The skeletons were not meant to show up in the comics or be part of the Exo-Force storyline. 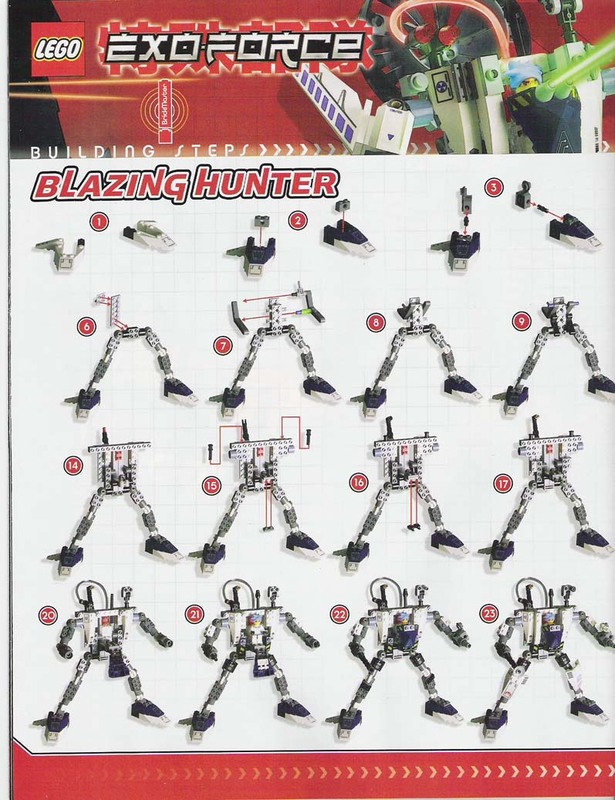 After strong sales in Exo-Force's first year (2006), the Golden City themed 2007 sets apparently did not sell as well leading to the announcement the series would not continue after 2008. Because of this, the 2008 story arc ended prematurely and the last two Exo-Force chapter books were cancelled. According to a post in a fan forum, series writer Greg Farshtey was quoted as follows: "The thrust of 2008 was going to be that Meca One kidnapped the Sensei. In the book, when EF goes after him, they wind up trapped in this underground facility. While there, Hikaru stumbles on a holographic recording of a young Keiken, which reveals that he knew about the Golden City decades before. He had journeyed there decades before in search of the secrets of more advanced robotics creation, which he was convinced that the occupants of that city knew. (And of course, you found out in the online comic the results of his discoveries there.)" official Lego homepage - LEGO.com The Official Web Site of LEGO ® products! Toys 'R' Us Hong Kong Exo-Force website - Toys R Us HK - Summer Toy Book now available at all stores! Over 1000 hot toys, Star Member's Savings over $1800.